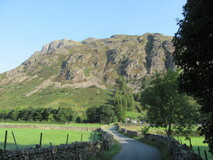 We had some vacation booked at the end of August, and after a bit of last minute research we settled on the Cumbria Way, and hastily ordered the guidebook. It was a mammoth seven hour journey to get up to the Lake District, although at least the train wasn't too crowded so we were able to get seats. Although it wasn't quite on route, we took a train connection over to Staveley, to visit Pete and Isobel, who we hadn't see for ages. Getting to Ulverston from Staveley was surprisingly tricky on the train. Luckily Pete very kindly gave us a lift there, although by the time we had looked round the town and walked up to the official start at a small car park called The Gill it was half past ten. 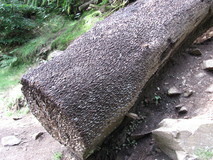 There was a sculpture marking the start, containing different types of rock encountered on the route. It was shaping up to be a good morning, with blue skies and sunshine. 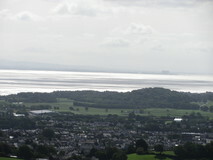 The path started off alongside a small stream, then crossed various fields, with views back over Ulverston and Morecambe Bay beyond. 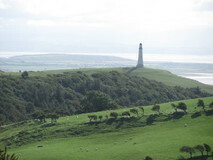 We could also see a lighthouse on Hoad Hill, which is actually a lighthouse-shaped monument rather than a real lighthouse. 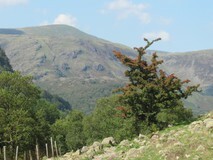 After Gawthwaite the route took a tiny road with enticing views of the fells ahead, and we sat down in the shade of a tree for a snack. We went a bit amiss crossing a field near Kendall Ground, but soon managed to get ourselves back on track. 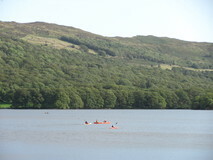 After the farm at Kiln Bank things really started to pick up, with nice grassy track through rolling bracken covered fellside, leading to Beacon Tarn, where a couple of families were picnicking by the tarn, and the kids were paddling about in the water. From Beacon Tarn we descended towards Coniston Water, skirting a large marshy area, then through a small valley with lots of juniper trees, although it seemed to take a while for the lake to finally appear. On reaching the lake, we sat on a bench and had a Clif bar and some nuts and raisins to keep us going over the final stretch, while enjoying the views. 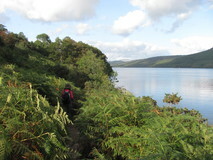 The path picked its way along the lake edge, through tall ferns, past clumps of colourful mushrooms, some rocky sections, then further on easier going through trees, before reaching the sprawling Coniston Hall campsite just before six o'clock. It was mostly car camping, lots of families with huge tents, but they were well spread out and there was still plenty of space. 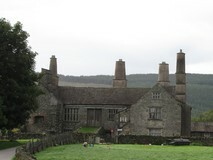 We headed towards the hall itself, guided by the unfeasibly large chimneys. The hall turned out to be more like an oversized farmhouse really, but it did have a reception for the campsite, so we got booked in, and bought a tin of baked beans to add some extra interest to our evening meal of noodles. Only one drawback with the site, the coin-operated showers took a rather hefty 50p, for which you got a very stingy amount of lukewarm water. 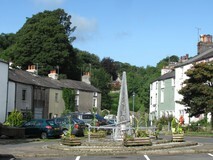 After packing up, we walked into Coniston village, and treated ourselves to a pot of tea and cooked veggy breakfast, then stocked up on noodles and extra bars. 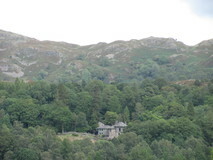 It was half past ten by the time we finally left Coniston. Easy grass track took us to a folly, which apparently used to be a dog kennel, then we climbed a bit, with superb views of the surrounding fells. 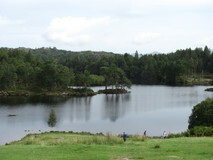 The paths from Coniston were fairly quiet, so reaching Tarn Hows was a bit of a shock, the large car park only a hundred metres from the tarn meant that the place was absolutely heaving. It was a pleasant wide easy track round the tarn though, and it passed by a fallen tree which seemed to have hundreds of coins embedded into it, which gave a strange effect. As we reached it, a passer by was enthusiastically hammering another coin into it using a large rock. 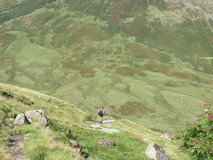 We left the tarn on a wide rocky track, and the crowds quickly disappeared. Near High Park we took a slight diversion to see the waterfalls of Colwith Force, and came across another fallen tree with embedded coins. 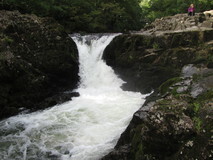 At Skelwith Bridge the route crossed over the River Brathay on a metal footbridge, and we temporarily left the route to head into the village, with short detour to take a closer look at the waterfall of Skelwith Force. There was a cafe in the village, and we got an excellent bean salad and cous cous salad, followed by vegan blackberry scones. 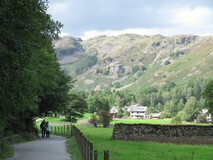 Easy riverside walking along a cyclepath took us to the village of Elterwater, then we passed by a large campsite at Baysbrown farm, with superb views of the surrounding fells. 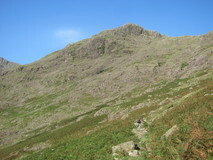 The last section traversed the fellside on a rougher path, before dropping down past a gigantic bull with spiky horns, to New Dungeon Ghyll. 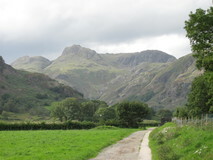 We arrived at the campsite at Old Dungeon Ghyll just after six o'clock. 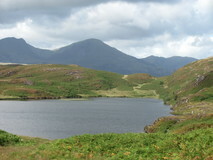 It was a nice spot, with superb all-round views, hot showers, car parking separated from the main camping area, and a small climbing wall on the side of a building, which was highly popular with all the kids. There was no mobile signal in the campsite, but they had the forecast pinned up in reception - it was looking good for the next day's stage to Keswick, but then turning to rain for the back of Skiddaw day. The campsite reception did breakfasts from eight o'clock, so after packing up we went and got cups of tea and veggy sausage rolls, which was a good start to the day. We were finally on the move just after half past eight. It was already sunny, with clear blue skies. 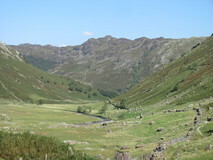 We pushed on along the easy track up the valley alongside Mickleden Beck, with amazing views ahead to the craggy fells at the head of the valley, where there was a small cairn, and a sign pointing to Esk Hause to the left, and Stake Pass to the right. The route took the right hand fork and started climbing up to Stake Pass. 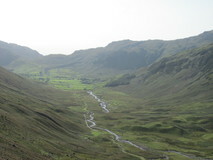 The climb was rocky and steep at first, but then flattened out a bit to cross a plateau of grassy lumps, before reaching the top, where superb views of the Langstrath valley appeared. 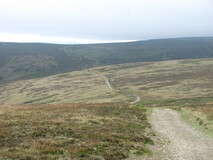 The hillside leading into the valley was quite steep, but the carefully constructed path had lots of zig zags so was an easy gradient. 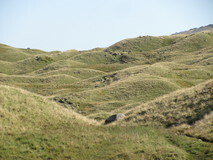 At the bottom of the zig zags, the path followed Langstrath Beck down the valley. 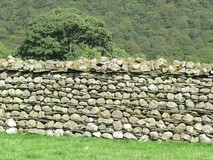 which was quite rocky in places so slow going. 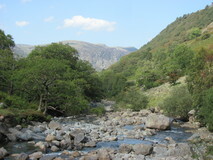 Near the bottom was a lovely stretch of river with lots of rocks and little pools. 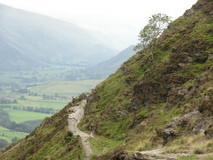 The path now temporarily joined the coast to coast route, and turned left past Stonethwaite, and then into Rosthwaite. It was about two o'clock by now, and we were definitely ready for a tea stop, so adjourned to the small cafe at Rosthwaite. 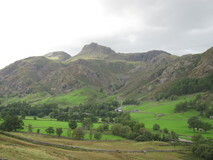 We sat outside with pint mugs of tea and toasted teacakes, and enjoyed the great views down the Borrowdale valley to Castle Crag. 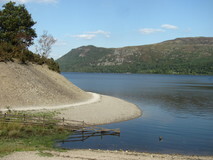 Since it was a Friday, we thought that Keswick might be busy, so we rang the campsite to check they had some space, but they reassured us that they could fit us in. 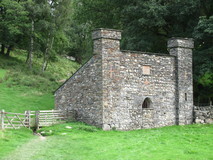 We pushed on along an easy path following the River Derwent, then entering a pleasant forest near Castle Crag, passing by a few old slate quarry workings. After Grange there was a short section on quiet road, before heading towards Derwent Water, where we passed a shed containing a small teddy bear in the window, alongside a load of postcards that people had sent, addressed to "The bear in the window". 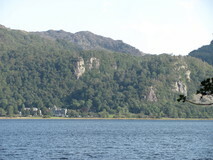 Along here were constant superb views of the crags and fellside across the lake. 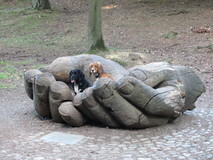 As we neared Hawse End there was a giant wooden sculpture of a pair of hands, into which a couple had placed their two dogs for a photo opportunity. We were definitely ready for another pot of tea by this time, and had hoped that we could make the good cafe at Lingholm in time, but the traverse of the Borrowdale Valley was a longer undertaking than we remembered, and we eventually passed the cafe just after closing time at five o'clock. 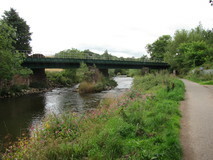 We pushed on through Portinscale, and over the suspension footbridge crossing the River Derwent, where some sort of guided tour seemed to be underway. 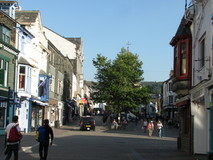 We finally arrived in Keswick at six, and headed straight to the supermarket to replenish supplies. We were ready for a change from the noodles, so bought some healthy-looking salad stuff for tea. 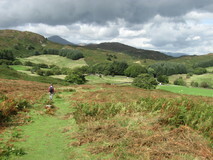 The camping was just a stone's throw from the supermarket, it was mainly a touring caravan site, that was apparently booked up for months in advance, but they had a very small grassy tent area just for walkers arriving on foot, which was an excellent result. It was one of those rare occasions where the tent was completely dry when we woke up in the morning, no condensation whatsoever, which made packing up easy. 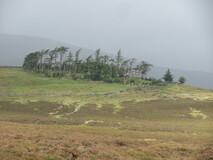 It was a cloudy day, although dry and all the hill tops were still visible. 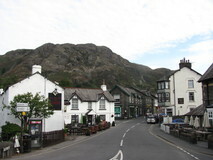 The route started off up Main Street, and on the way we popped in to a cafe for some breakfast, and got a pot of tea and two rounds of beans on toast, before finally getting going at half past eight. The street was full of stalls for the Saturday market, and as we passed by one of the stall-holders borrowed my trekking poles to try and retrieve a mains extension lead that they had somehow got stuck over a bracket high up on the side of a building. 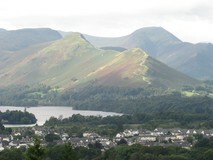 Once we left Keswick, a stiff climb took us up to the car park near the top of Latrigg, where we came across signs for a fell running race, the 44 mile Grand Tour of Skiddaw. Near the car park there was a tent pitched up to act as a drinks stop for the runners. 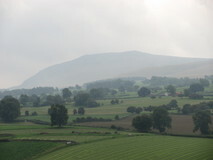 We could see the wide track heading up Skiddaw, with lots of people on it, but the Cumbria Way branched off and contoured round Lonscale Fell before heading up the valley between Skiddaw and Blencathra, towards Skiddaw House. 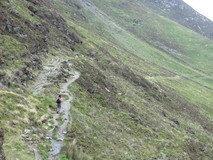 As we walked up the valley, runners started coming past every so often. We reached the rather windswept looking Skiddaw House YHA, and had just sat down for a snack when someone came out and put a sign up saying that the hostel was open today for passers-by to come in for cups of tea. 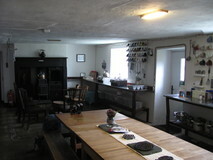 As it was just past time for elevenses, we didn't need much persuading, and adjourned to the cosy kitchen area in the hostel and made a pot of Earl Grey tea on the stove. Leaving the hostel, we could see a steady stream of runners heading up the hill towards us. 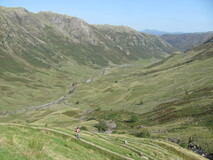 A passer-by asked one of the runners how far they had left to go, to which they replied 28 miles. 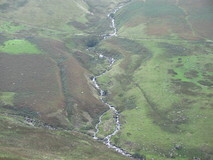 The Cumbria Way route descended to cross a stream, which was the upper reaches of the River Caldew. 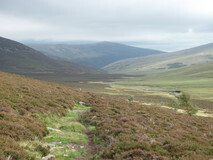 We pushed on down the valley on easy track, passing a couple of circular stone sheepfolds, and a few more runners. Further down a woman walked by carrying a large canvas bag over her shoulder full of route markers that she was collecting up behind the last of the runners. 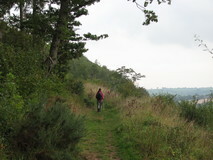 As we got further down the valley, the path turned into a wider track, and eventually met a road, where a few cars were parked. 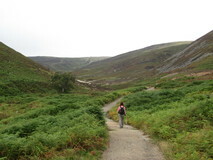 We headed up an old mining track alongside Grainsgill Beck, past ruins and spoil heaps from disused lead and tungsten mines. A final steep hillside got us up to the shoulder and the Lingy hut, which from the outside looked like someone's garden shed that had gone astray, but inside was quite comfortable, with wide benches that would be good for sleeping on. 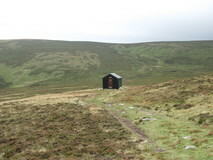 From the hut, we started off along an easy track, then turned off to do the short climb to the summit of High Pike. 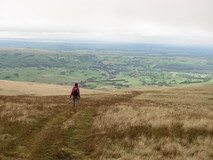 There were superb panoramic views, we could see the Solway Firth, some huge antennas in the distance, and the village of Caldbeck down below. 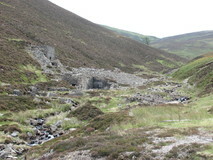 After a quick snack we started descending in the direction of Caldbeck on grassy track, past some old mining works. Near the bottom of the track, signs for the running race reappeared, and a couple of runners went past as we did the final bit into Caldbeck along a minor road. 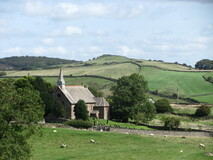 We pushed on to the small campsite, which was on the other side of the village, just after the last houses. 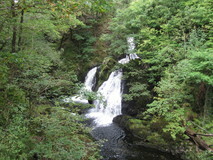 It was literally right beside the Cumbria Way, on a narrow strip of grass, with a river on the other side. It was a fairly low key site, just a couple of loos and a metal hut with a sink and a tap, which was fine for us. After a chat with the owner we pitched up and got a pot of tea on followed by noodles. 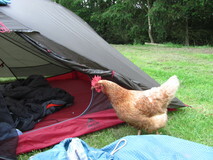 A hen and a cockerel came over and inspected our tent, closely followed by a few sheep. We had been following the course of the Grand Tour of Skiddaw race off and on all day, and the course actually continued past our tent and on to just outside Dalston. 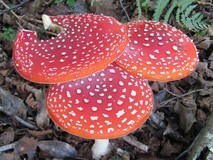 As we cooked our tea, occasional clumps of runners passed by, and a few were still coming through after dark. They had now done almost 40 miles, and although some people looked rather weary, they all seemed very cheerful. There was some drizzle during the night, but it was dry again by the time we woke up, and we packed away the wet tent and got going at half past eight. 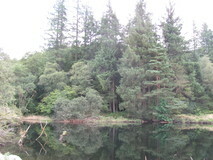 There were some pleasant forest sections to start off, with occasional views back to the fells. All the running route markers had disappeared, so they must have had a swift clear up in the dark after the last runner went through. 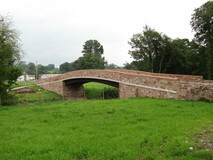 We reached a very new looking road bridge at Bell Bridge, which replaced the original one that had been destroyed by the floods in 2016. 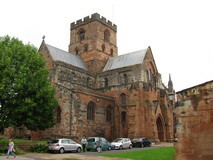 They had also built a new stone seat beside it, so we took advantage of it and stopped for some bombay mix and a bar. 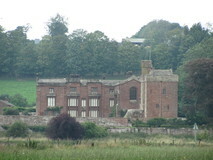 We continued on easy grassy path alongside the River Caldew, passing good views of Rose Castle, and reached Dalston just after one o'clock. There wasn't quite as much there as we expected, but we were feeling quite hungry by this time, so stopped at the small cafe in the centre for a pot of tea and some food. After Dalston it was easy going on cycle path, in places squeezed between the railway line and the river. 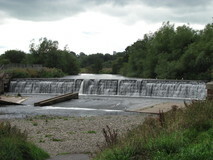 As we got nearer to Carlisle we passed a large weir where there was a heron fishing, and then further on we passed various flood defences. 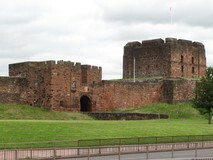 The cycle path took us nearly all the way to the city centre, where the route popped out beside a castle. 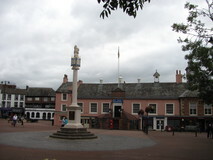 We continued through the cathedral grounds, before arriving at the cross outside the Tourist Information Centre, which was the official end of the route, just after four o'clock. We had a quick look around, then headed over to the railway station. 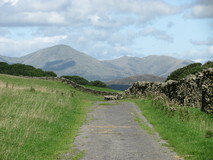 The route is not completely waymarked - some signposts have the Cumbia Way marked on them, but not all of them, and on the higher fells not much at all. So you definitely need a guidebook and maps. 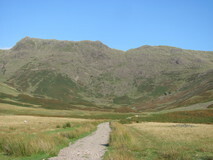 There are plenty of campsites on the route, in some great locations - the official Cumbria Way site has a very comprehensive list of campsites, hotels, B&Bs, and hostels. The route is well served by trains at both ends.